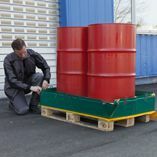 Cargo Spill Containment Berms have been specially designed to transport hazardous liquids on pallets. 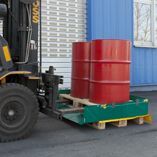 The pallet can be placed laterally via forklift in the opened spill containment sump. The berm is put on a pallet and, in this way, it can be easily transported by a forklift. 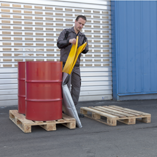 The Cargo Spill Containment Berm (FMA.C1 and FMA.C2) accommodates euro pallets; as regards the dimensions, the berm FMA.C3 has been specially designed for the use of chemical pallets (1.140 x 1.140 mm). The berm FMA.C1 is equipped with metal fittings, steel ropes and carbine hooks and, therefore, it can also be used as a multi-functional spill containment sump. 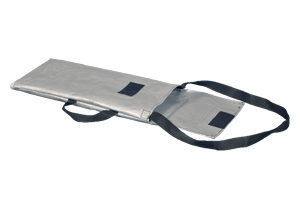 ​​​​​​FMA.C1 is equipped with metal fittings, steel ropes and carbine hooks (FMA.C2 and FMA.C3 are without them). 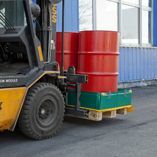 ​​​​​​Fields of application: Particularly for chemical industry, transportation of hazardous materials and logistics (freight traffic, shipping) as well as for the mobile storage of fuel, stocks of combustible materials in 205 litre drums. ​Very light: The berms C2 and C3 only weigh 5.5 and 7 kg! 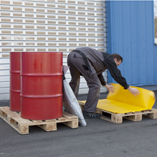 ​​​The collapsible sidewalls provide enormous handling advantages when loading the Cargo Spill Containment Berm. ​​A level indicator shows the actual volume of liquid in the tank. ​​​​​​Thanks to the built-in wall reinforcement, the foldable berm remains stable without any auxiliary devices. 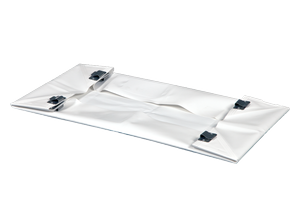 ​​​Once folded up, the Cargo Spill Containment Berm is placed in a well manageable bag, so that it can be carried easily and stored in a space saving way. ​Material: PES, PVC surface. 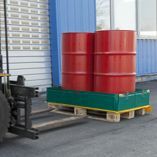 Resistant to a wide range of liquid chemicals, particularly to common operating fluids, such as heating oil, diesel, hydraulic oil, gasoline, etc. (see Chemical Resistance List). 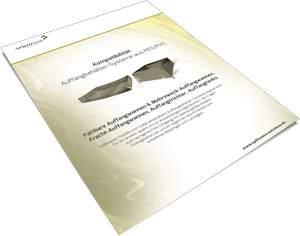 ​​For the Cargo Spill Containment Berms, bags and groundsheets are optionally available as accessories; for the berm FMA.C1, a protective inlay is also available. 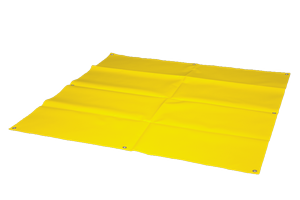 For the Cargo Spill Containment Berms, bags and groundsheets are available as accessories; for the berm FMA.C1, a protective inlay is also available.